BREAKING: Charlotte Police Release Two Videos of Keith Lamont Scott Shooting Death; Scott Hands at Sides, Stepping Back | Democracy Now! 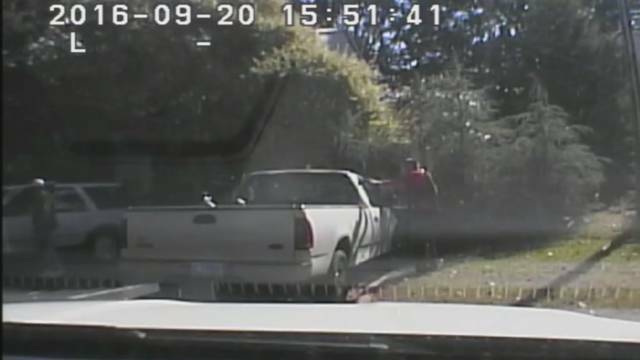 In North Carolina, Charlotte-Mecklenburg police have released two videos of Tuesday’s police shooting of Keith Lamont Scott, one from a police dashboard camera and the other from an officer’s body camera. Police say they have other video that they have not released. The Scott family is asking the police to release all of the videos. The dashboard camera video shows Scott exiting his vehicle and taking steps backwards with his arms both at his sides. Police fire four shots at Scott and he falls to the ground. The first 11 seconds of this video are silent. The body camera video shows Scott on the ground after being shot. The first 25 seconds of this video are silent. On Friday, NBC News obtained cellphone video capturing the shooting, filmed and narrated by Scott’s wife Rakeyia Scott. While the police claim they tased and then shot Scott because he was armed, Scott’s family says he was not armed—except with a book in hand. They say 43-year-old Scott, an African-American father of seven, had been sitting in his car, waiting to pick up his son after school. Click here to see the video Scott’s wife Rakeyia Scott filmed during the shooting.